While the “Buda” side of the city hosts Budapest’s major tourist attractions, the “Pest” side is where the locals hang out. 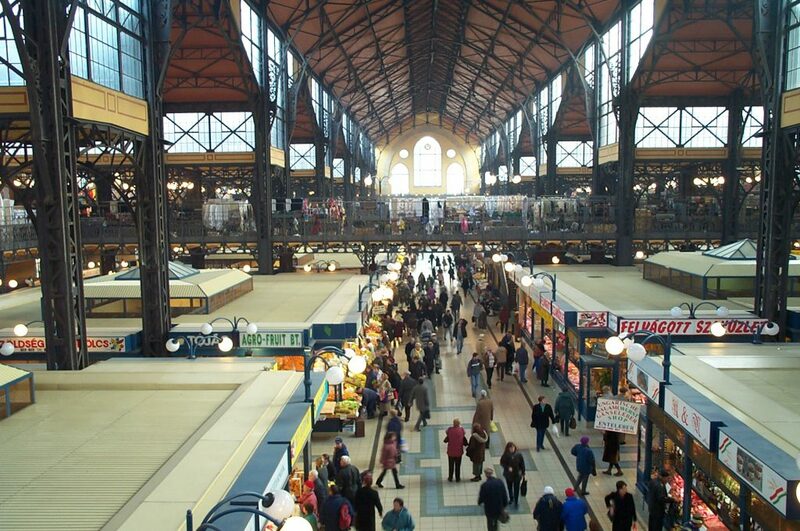 It hosts the majority of the shopping, many of the restaurants, and most of Hungary’s great municipal buildings and temples. You may stand in awe of the sights on the West Side, but in all likelihood you’ll spend most of your money in the East. 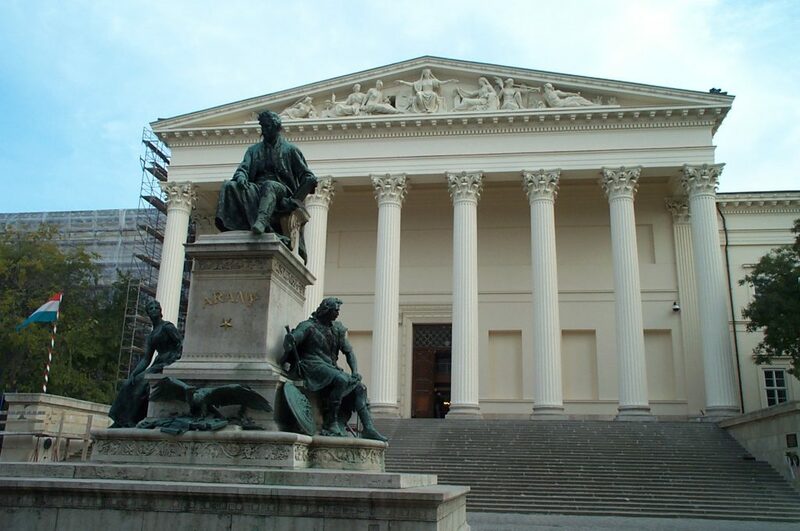 A fantastic place to start your tour of Pest is the Hungarian National Museum, pictured above. This is one of the best national museums I have seen — it is a beautiful building with very well organized and educational exhibits. The museum detailed Hungary’s history from the times of the Roman occupation, the ruins of which can still be seen at the town of Aquincum just ten minutes to the north. I confess to have had very limited prior understanding of the Austro-Hungarian Empire and its importance in central European history, such as how Hungary served as a major battlefront against the Ottomans, and how this empire grew into a very complex multi-ethnic tapestry in which the Austrians and Hungarians (and a bunch of other groups) held an unstable relationship that fell apart in World War I. 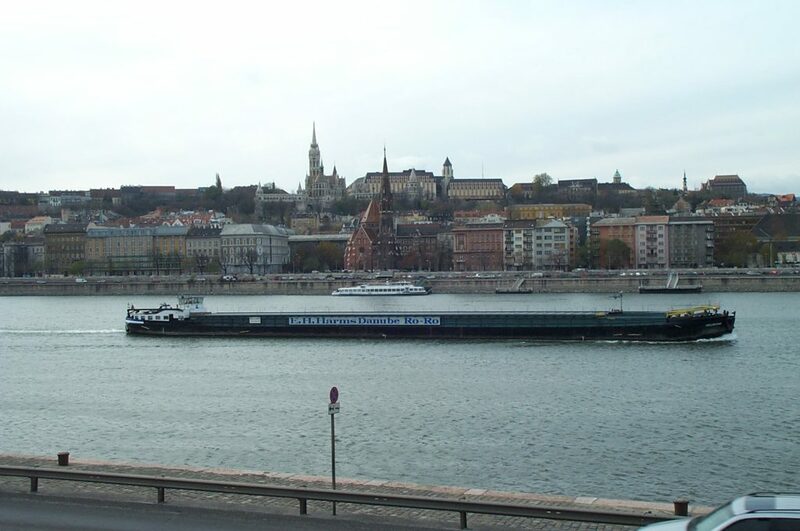 From the Museum, which was near my hotel, I moved westward toward the Szabadsag Bridge to the southwest. There I encountered a massive enclosed marketplace along Sohaz street, shown from a second-floor walkway in the above photo. This was mid-morning, soon after the Market had opened as people were flooding in–it was very cold that mid-November day so the food stalls and coffee stands were busiest. I do not recall the precise route I took from there, but I generally did a loop to the north toward the Parliament Building, encountering a host of monuments and sights along the way. 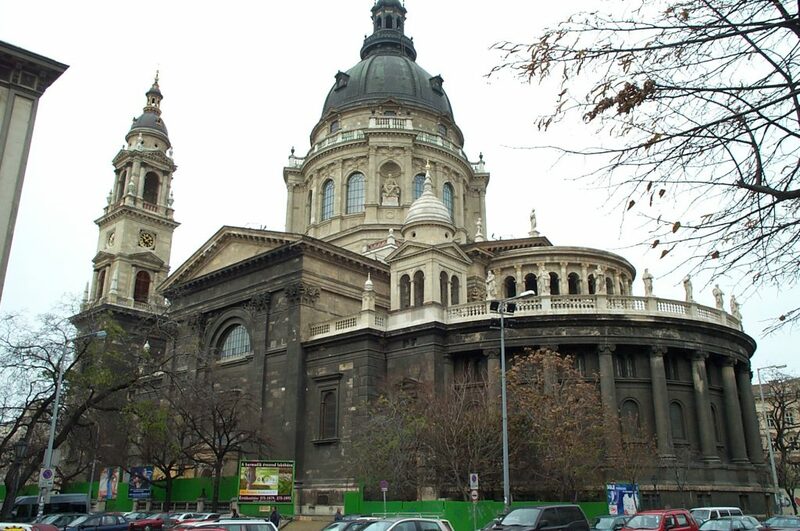 There was a fantastic Jewish Museum and Synagogue north of the National Museum, St. Stephens’ Basilica (shown in the third photo above), and then ultimately the Hungarian Parliament building on the river in the north-central part of the city. 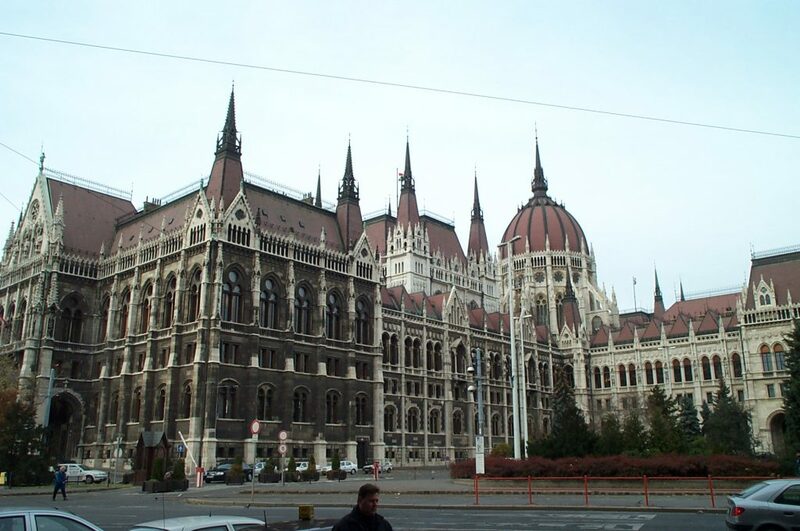 The Parliament, seen below, is surrounded by a number of national buildings that are worth a look, and the best (and most elaborate) part of the building faces the river. Visitors are permitted when parliament is not in session. I took the below shot from the Danube side of the Parliament building. In the distance (I believe) is the Saint Matthias Church which in the Buda Castle chapter of this travelogue was blocked. The National Military Museum, which I did not have time to visit, is further up to the right. If visiting in the summertime, then you will want to venture further to the north to the island of Margaret. Margaret cuts in the middle of the Danube and is a bustling City park with amusements, swimming pools, and food stands. So, while you may be tempted to spend all your time in the classic Old Buda Castle, be sure to allocate plenty of time to explore the East Bank, too!